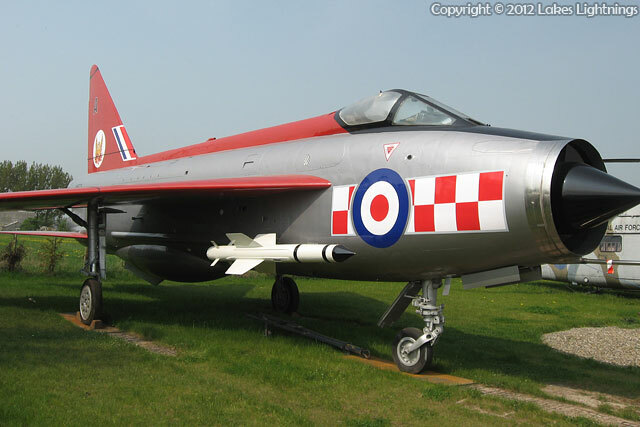 First flown on 1st November 1960, XM173 first served with 56 Squadron at RAF Wattisham and was part of The Firebirds display team. Reassigned to 226 OCU at Coltishall in 1965 when 56 Squadron upgraded to F.3s, XM173 served with the OCU until 1972 when she joined the Target Facilities Flight at RAF Leuchars and then RAF Binbrook. Last flown on 31st December 1973, she was then stripped for spares and used as an airfield decoy at Binbrook. She was used to trial some new paint schemes in 1975 and in 1976 was painted up in 56 Squadron colours and transported to RAF Bentley Priory for gate guard duty. This she carried out until being put up for disposal in 2007 with the closure of the station. XM173 was thankfully bought by MSS Holdings Ltd. and was moved by road from RAF Bentley Priory to their SMP factory site near Kirkham, Lancs where she underwent a restoration before going back in the public eye at the factory as a gate guard. She is a complete airframe but regrettably they had to cut the tail and outer wings off to facilitate the road move. She didn't stay there too long, however, being moved in August 2012 to a yard near Old Sodbury in Gloucestershire. After some cosmetic restoration work she then moved to her current location - suspended from the ceiling in the Dyson staff canteen!